Both sexes: Dumpy, buff-grey bird with orange face. The Grey Partridge (or Common Partridge) is a small, dumpy bird that appears a rather drab grey-brown at a distance. They are smaller than both Pheasants and Red-legged Partridges, but larger than Quails. Close-up it is quite attractively marked: the upperparts are grey-brown with chestnut streaks, the breast is grey with a dark brown horseshoe mark on the belly, the flanks have chestnut brown bars, the tail is rusty-red, and the face and throat are orange. The bill is horn coloured and the legs are grey. The sexes are similar except that the horseshoe mark is smaller and less distinct in the female. Juveniles are brown, have yellow legs and lack the orange throat and dark belly patch. The male's song is a grating and repeated "kerrr-ick". Primarily a bird of farmland but also moors and heaths, the Grey Partridge feeds mainly on grass leaves and seeds like clover, cereal, and grain. However, their chicks are fed on insects. The nest is usually on the ground under the cover of a hedge or other tall plants. The eggs, which are about 36 mm by 27 mm, are smooth and glossy, and uniform olive-brown. The hen incubates the eggs. The precocial nestlings are able to feed themselves, but both parents care for them. The nestlings' wing feathers appear after about 5 days and they can flutter at 10 days, but they are not fully fledged until 28 days. 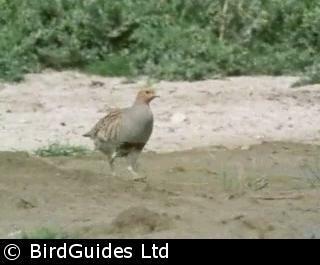 Grey Partridge are sedentary and even the young rarely move far from their natal grounds. Changes in farming practices, such as autumn sowing, hedgerow destruction and use of insecticides and herbicides have all contributed to the decline of this once widespread game bird. Set-aside (uncultivated land in which various wildlife habitats may develop over a number of years), wide field margins and traditional hedgerow management can help to halt and reverse their decline.